The new Count and Countess Ciano spent their honeymoon on the Capri island, where they were triumphantly received by a big crowd. 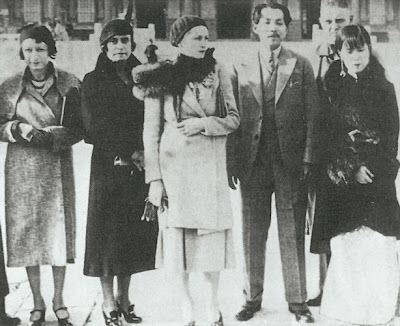 The couple was staying in a four-room suite at the Hotel Quisisana, and, upon their arrival, they found a telegram from Mussolini, who wanted to be the first person to salute them in Capri. The couple spent a few happy days visiting the isle and dining in their bedroom. 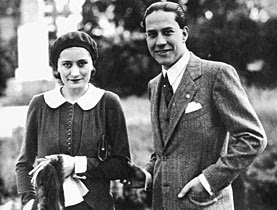 They were followed around both by the press and the secret police that would report their every move to Mussolini, but Edda and Galeazzo wanted to be alone and see no one. They only made an exception for Filippo Tommaso Marinetti, the founder of the Futurist movement. Pretty soon, it was time to go back home. Galeazzo was working at the Italian embassy in the Vatican city. After the wedding, he was sent to China, where he would act as general consul. He was really happy to go back to that country. He had already lived for a while in Pekin and loved it, because there, unlike in the Vatican where he had to behave like a saint (or at least pretend to), he could just be himself. Edda would obviously go with him and, on 11th September 1930, the couple embarked on the ship that was to take them to China. The temperature on board was really hot, even during the night and because Galeazzo, who was very sensitive to the cold, would forbid Edda from opening the portholes, the couple started sleeping in two different cabins. The ship finally arrived in Shanghai. Edda was in love with the city, its sparkling lights, the exciting atmosphere, the luxurious lifestyle of the rich European and American businessmen and diplomatics residing there.. it was a far cry from the provincial Rome she came from. Soon, her lifestyle became hectic. She drank, played poker (losing big sums and piling up debts), and just generally had a good time. Her house became a salon for intellectuals, journalists, diplomatics and everyone who was anyone in China. More importantly, she wasn’t under her father’s control anymore. Sure, he would often send her telegrams and letters full of recommendations and instructions, but he was still many miles away and Edda felt free to finally be herself and, although she was never allowed to forget who her father was (this would prove beneficial especially for their job there), she enjoyed a great deal of independence. She would host sumptuous dinners to enhance the image and prestige of Italy, and to try and improve business deals and relationships between the two countries. This way, they even managed to turn those who disliked Italy and Mussolini, such as English journalist Woodhead, into a fan of both the countess and Italy. Her stay in Shanghai wasn’t always peaceful and serene, though. In those days, China was fighting a war against Japan. At one point, the Japanese soldiers arrived at the outskirts of the city. The city could fall at any moment but Edda, unlike many diplomatics who were quickly leaving the city with their families, decided to stay. This decision was partly due to her love for taking risks, partly to a good deal of recklessness and partly to her innate drama sense. Part of the press praised her for it. Woodhead excitedly exclaimed: “The First Lady of Shanghai doesn’t leave the city!”, which ended up in the papers. Edda not only stayed in Shanghai but she also visited the battlefield, where she admired the efficiency of the Japanese army and pitied the poor Chinese soldiers. When the danger was over, Edda went back to her usual lifestyle. And seventeen months after the wedding, Edda gave birth, at home, to the couple’s first child. It was a boy and they named it Fabrizio, against Mussolini’s wishes, who preferred Giorgio or Guido instead. Pretty soon, though, the baby was nicknamed Ciccino. Despite being so far away from home, Edda kept receiving Mussolini’s letters regularly and kept herself up to date on Italian news. She also didn’t hesitate to express her political opinions to her father, telling her that, according to her, fascism was turning Italy into barracks, which she blamed on the new party secretary Achille Starace. “Sergeants may be necessary, but I don’t love them,” she wrote. Mussolini replied that he would keep her opinions in mind. Edda may have been right in her observations, but she also had personal reasons not to like Storace. She had hoped her husband would have become the new secretary of the Fascist Party instead of him, despite the fact that Galezzo wasn’t interested in (and probably didn’t have what it took to fulfill) that role. Edda loved Shanghai and didn’t want to leave it. But Mussolini had other plans. He missed his daughter and wanted her back, and he communicated it to her in September 1932. Edda was furious. She didn’t want to leave her beloved Shanghai and to make things worse she discovered she was pregnant again. She wasn’t happy about it. She really didn’t want any more children after Fabrizio and especially not so soon. But the two things just couldn’t be changed and, after two yeas and eight months in Shanghai, the Ciano family arrived in Brindisi in late June 1933.